Are you a big fan of grilled cheese? Well, I am and I just love any kind of grilled cheese sandwich, especially when the cheese is completely melted. Making sandwiches are my all time favorite, their easy to make, very tasty, very quick to make and completely filling. This hearty scrambled colorful golden tofu sandwich packed in rye bread with slices of provolone cheese grilled is too good to eat only for breakfast. It’s also makes a great incredible weeknight meal. I’m a total vegetarian and so is my family, but there was a time when we did consume eggs at home for things like omelette, scrambled eggs and baking. We grew up thinking that we were not getting all of the nutrients, vitamins and minerals as required by just consuming vegetables and lentils so we had to combine our meals with eggs to balance out things. Well ! that theory was absolutely wrong! It’s been now many years since we all gave up eggs, but to be honest I don’t miss it at all. The versatility of tofu is absolutely amazing, it’s one of the most miraculous adaptable plant-based products. Tofu has the power to take on what ever flavor you choose to give it. I’ve started to consume tofu in many of my dishes, as a vegetarian I find this to be an absolutely great go-to source of protein. Many people have their own opinions on soy-based products and controversy surrounding soy-based products. For me tofu is a great new experience and love the versatility and the health factors related to TOFU. This sandwich is super delicious ! it’s a bit spicy, a bit tangy, a bit gooey, but completely mouth-watering. 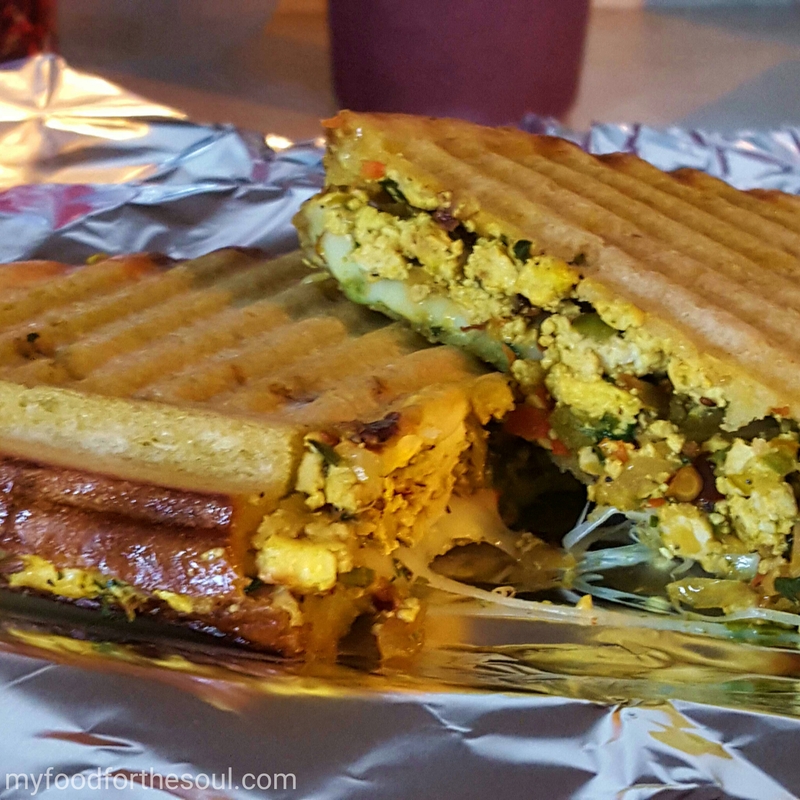 The best part of this special scrambled tofu veggie sandwich is that it can be made the night before and prepared and grilled or toasted in the morning for the perfect breakfast or prepare it and take it for lunch. It’s completely revolutionary …let you imagination go wild, to me sandwiches are fun, creative and so versatile. No set ingredients or recipe to follow, there’s no right method to make it …. you can grill it, toast it, fry it or bake it. 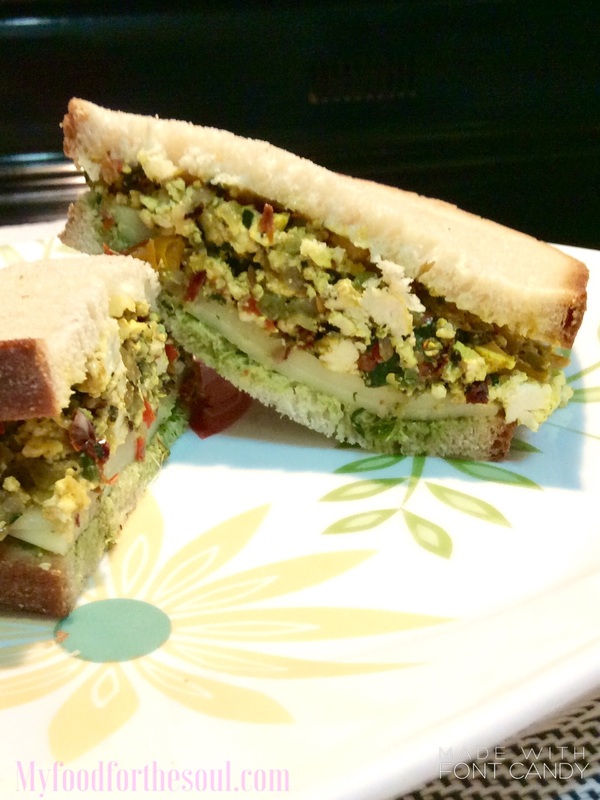 I have posted other great sandwich recipes before like Paneer Bhurji Sandwich which has been recognized and published in the Helping the Homemaker Article as 100 Healthy Breakfast ideas. 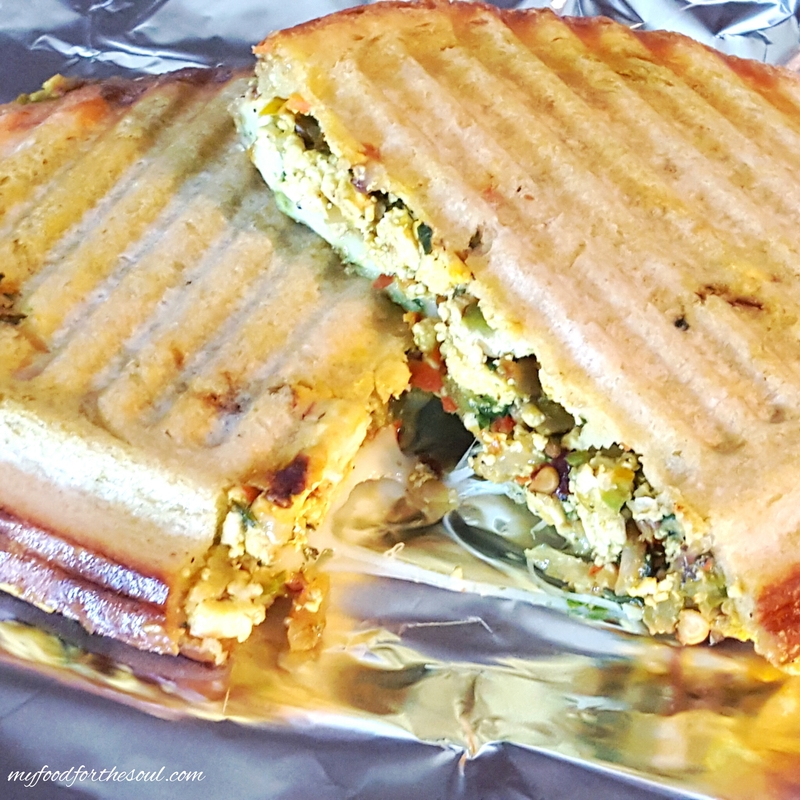 Another great breakfast/lunch or even snack,picnic idea is the Cucumber Cheese Chutney Sandwich or the Egg-less Spinach Tomato Omelette Sandwich. Another great thing about these sandwiches is that I like to use Chutney as a spread which gives it that extra kick and taste mind-blowing. Some of the chutneys that I use on my sandwiches are Green Coriander Chutney, Mint Coriander Chutney and Mumbai Style Green Chutney. Cheese is just another great addition to any sandwich. Cheeses come in many different varieties, flavors and textures. My all time favorite is Provolone Cheese which we buy right from the Italian Deli. This cheese has the sweet mild flavor, when melted it’s got just the perfect smoothness and creaminess. Heat oil in a kadai or wok, once hot add in jeera saute for 30 seconds;add in onion and garlic and cook till slightly golden brown. Add in fresh coriander leaves and toss all together well and keep aside. Let mixture cool down for at least 5 minutes. Take a bread slice spread your favorite chutney or butter/margarine; place two slices of cheese side by side; and spoon some filling onto the cheese and spread to cover cheese, spread butter/margarine on other slice of bread and cover sandwich. Grill it or toast it on a sandwich toaster or pan fry it on a tawa (fry pan).